• Please leave approximately 1cm of envelope bordering each stamp. The rest of the envelope can be discarded (which will make it cheaper to send). • The value of a stamp does not matter, so 1p stamps can be grouped together with £1 stamps. They no longer accept stamps for fund-raising. • Trim stamps leaving 1/4″ border around the perforations. • If using a box, place stamps in carrier bag first. This makes it easier to weigh them. • Bank coin bags damage stamps and are fiddly to open. • Stamps covered in sellotape or cancelled by pen are not collectable. • Do not forget to put a slip with your name, address and phone number in with the stamps. This will be shredded later, if not needed. • Put stamps in plastic carrier bags with the handles tied across. • Place 6-8 full bags into a post office mail sack, usually available at local post offices. • Tie the neck of the mail sack with an addressed tie-on luggage label. • Send via Parcel Force, cost is about £12.50 for 20Kg (44lbs). • Postage surcharges will be refused. • Close trimming is rendering several thousand stamps a month unsaleable. Please click here for an address to send all used stamps to. Ken Weinling lives in the London Borough of Hillingdon with his family. His guide dog, Terry has just retired so he is waiting for a new dog. 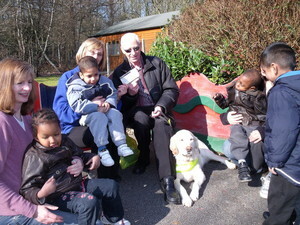 For many years he has worked hard to raise funds for Guide Dogs for the Blind, as well as running a local support group. Apart from all that, he likes to support local good causes. He does so by giving talks about life with his guide dog Terry and through fundraising with his friends. So please send used stamps to help those who need a guide dog. Seeking donations of worldwide and U.S. stamps, albums, stockbooks, stock pages, and other stamp collecting supplies. These will be used for a stamp program for children ages 6 to 12.
please send me used 100/200 stamps. A friend, who collects used stamps for the RNLI also started this website with more links to charities in the Uk who can make very good use of any used postage stamps that you are able to donate. Charities not listed can also contact this site to be listed. Can you throw any light on this. Thank you for your email. I’m afraid we no longer have the facility to recycle stamps. ‘Carers Centre Hull’ is collecting used stamps to raise further funds so please send us your stamps. We can raise money from both British and overseas stamps. It doesn’t matter if they have already been used, or if they are everyday first or second class stamps.